In this video, I discuss the amygdala. The amygdala is a collection of nuclei found in the temporal lobe; it is best known for its role in fear and threat detection, but its full range of functions is much more diverse. I discuss some of the major nuclei of the amygdala, a common scheme for the anatomical organization of the amygdalar nuclei, and some of the functions that have been associated with the amygdala ranging from threat detection to the processing of positive stimuli. Despite the great strides that have been made toward a more egalitarian society in the United States over the past 50 years, events like what occurred in Ferguson last month are a bleak reminder of the racial tensions that still exist here. Of course, the United States is not alone in this respect; throughout the world we can see abundant examples of strain between different races, as well as between any groups with dissimilar characteristics. In fact, it seems that the quickness with which we form a negative opinion about those who are not members of the same group as us may be characteristic of human nature in general, as its effects have been pervasive throughout history, and it persists even when we attempt fastidiously to stamp it out. Indeed, it may be that our inclination towards prejudicial thinking has its roots in what was once an adaptive behavior. Some argue that our ancient hominid ancestors may have benefited from living in small groups, as this allowed for joint efforts in gathering and protecting resources. A logical offshoot of the development of group living would have been the emergence of skill in being able to tell members of your group apart from those who were not. It might have paid off to be wary of those who were not part of your group, as they would have been more likely to pose a threat. According to this evolutionary hypothesis, prejudice--which can be defined as an opinion of someone that is formed based on their group membership--may be the result of this strategy being so effective in the past. In essence, we may be saddled with the mindset of our evolutionary ancestors, which makes us more skeptical at first of anyone whom we see as "different" than us. If prejudice is a deep-seated human behavior, it would not be surprising to find networks in the brain that are selectively activated when someone has xenophobic thoughts. One area of the brain that has been investigated in this context is the amygdala. 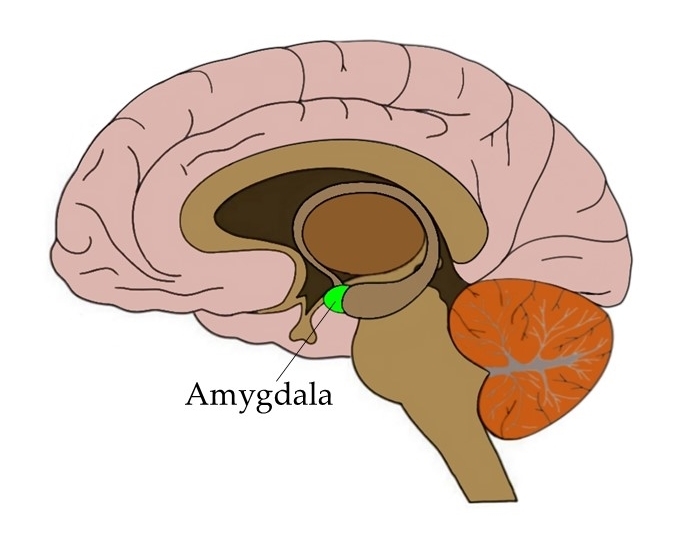 The amygdala is often associated with emotion, and is perhaps best known for its role in fear and the recognition of threats. If you were walking in the woods and saw a bear, your amygdalae would immediately become activated, helping to bring about a fear response that would encourage you to run away (or maybe cause you to freeze in place). Several neuroimaging studies have looked at what happens in the brains of people when they see images of others outside of their racial group (e.g. white people looking at images of black faces). Some findings from these studies include: the amygdala is activated upon seeing such images, amygdala activation is correlated with xenophobic attitudes of the viewer, and amygdala activity in white people is higher when viewing black faces with darker skin tone. Thus, the amygdala may serve as a threat-detection mechanism that is reflexively activated when we see an outsider. Perhaps because this has been adaptive in the past, it may act to put our brain on alert when someone outside of our racial group is near. In many societies today, however, where we are attempting to make racial divisions less distinct, this knee-jerk reaction seems to be counterproductive. Another area of the brain that has been associated with prejudice in neuroimaging studies is the insula. The insula is also involved in processing emotional states, and has been linked to mediating feelings of social disapproval. For example, one study found that the insula and amygdala were activated in individuals while they viewed pictures of of people deemed to be social outcasts, such as homeless people or drug addicts. Because the insula is also activated when viewing pictures of people outside one's racial group, it has been hypothesized that the insula is involved in feelings of distaste that may arise when experiencing prejudicial thoughts. The striatum, a subcortical area thought to play an important role in reward processing, also has been implicated in prejudice--albeit in a very different way than the amygdala and insula. Activity in the striatum correlates with rewarding experiences, and neuroimaging studies have found that the striatum is also activated when looking at pictures of individuals from one's own racial group. When white participants were tested for implicit preferences (i.e. preferences they may not state or even be aware of, but that they still seem to possess) for people of their own race, activity in the striatum was stronger in response to white faces in those who scored higher on the test for implicit preferences. Thus, there may be activity in the brain that reinforces our tendency toward prejudice in at least two ways: 1) we may be more likely to feel fear and aversion when seeing someone of another race, and 2) we may be more likely to experience positive emotions in response to seeing someone of our own race. So, if there are structures in our brains that promote prejudice, does it mean attempts to reduce our prejudices--both individually and societally--are a lost cause? Of course not. Just as there are brain structures that may make us more likely to recognize differences, there are also structures (e.g. areas of the frontal cortex) that allow us to exert control over those potentially reflexive reactions. It's possible that the recognition of deep-seated mechanisms for prejudice could help us to understand racism a little better. It could, for example, provide insight into why people in high-stress situations may be more likely to see things as divided down racial lines. For, if their brains are already inclined to see people of another race as more threatening and they are in a stressful situation, they may be quicker to identify someone of a different race as the threat. However, the extent to which such innate responses to outsiders affects our behavior is still somewhat unclear, and the hypothesis that such responses are remnants of once-adaptive behavior is just that: a hypothesis. For practical purposes, it may not matter exactly what the basis of prejudicial thinking is, as we are certain it's a thought pattern that doesn't have much remaining value in today's world. However, being open to the idea that we have some inclinations toward prejudicial thinking may help us to be able to train people to more mindfully deal with high-stress interactions with people of another race. For, instead of pretending these prejudicial thoughts don't (or shouldn't) happen, it would allow us to focus more on ways to mitigate the damage that might occur when they do.